Just bowls, a whisk and spatula are needed to make this tender, buttery pound cake recipe. 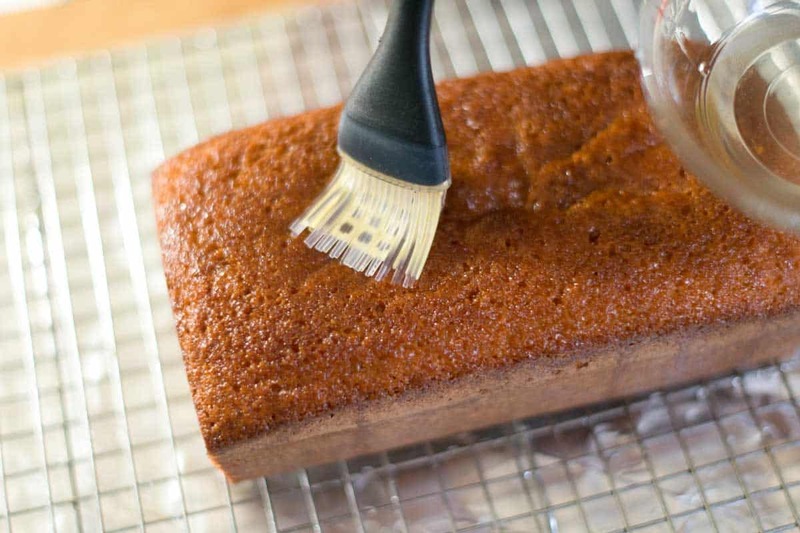 Jump to the Buttered Rum Pound Cake Recipe or read on to see our tips for making it. The batter is flavored with orange, vanilla and dark rum. We absolutely love it served in slices with a big dollop of whipped cream. It is also lovely served with any juicy fruit, especially berries. 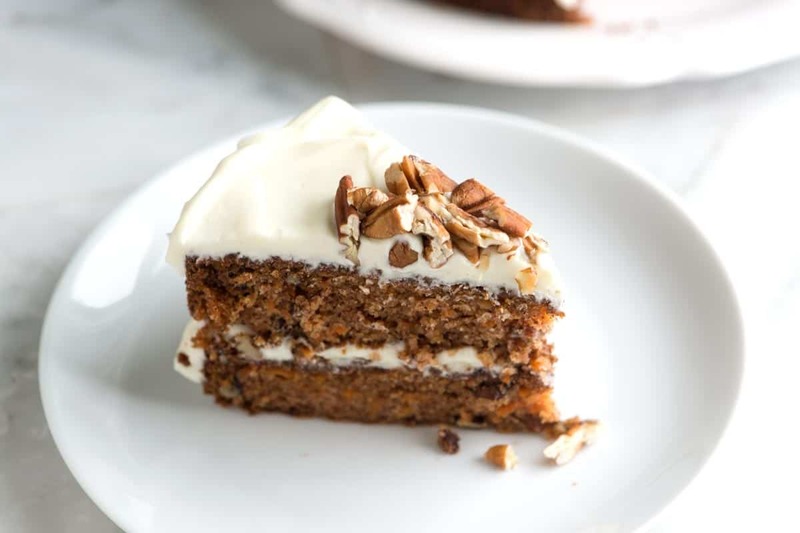 YOU MAY ALSO LIKE: An incredibly moist carrot cake recipe with an ultra-creamy cream cheese frosting. This is a must make! Jump to the full Carrot Cake Recipe. 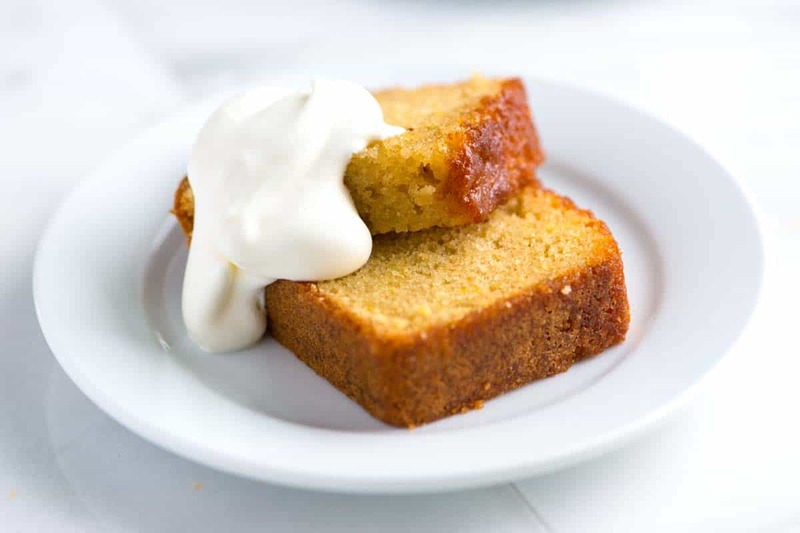 Not only do we add strong, dark rum to the cake batter, it is also added to a syrup that gets soaked up by the cake just as it comes out of the oven. The syrup is simple to make — just water, sugar and rum. Since the cake is warm, as you brush it all over with the syrup it soaks in the flavor and moisture of the syrup. That’s what really makes this pound cake recipe over the top. We love the addition of rum, but you could certainly use your favorite liqueur — just make sure it is strong, otherwise the flavor will be lost. We’re thinking Grand Marnier or aged tequila would be a great alternatives. 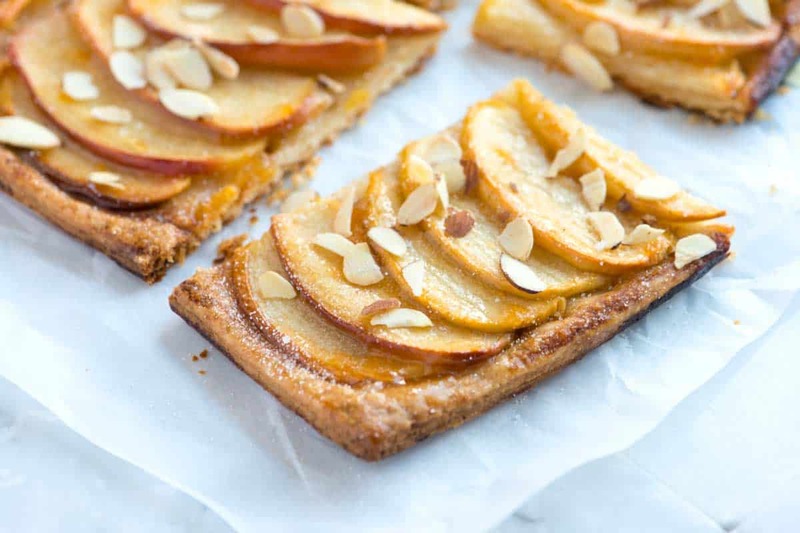 YOU MAY ALSO LIKE: How to make a stunning apple tart with a buttery crust, thinly sliced apples, and toasted almonds. Jump to the Simple Apple Tart Recipe. This pound cake is very simple to make — just bowls, a whisk and a spatula are necessary. The cake itself is flavored with orange, vanilla and dark rum. Just as the cake comes out of the oven, we drench it with rum syrup. Divine. The rum used really needs to be dark and strong — otherwise it gets lost. We use an 8 1/2-by-4 1/2-inch loaf pan for this. If you are using a 9-by-5-inch pan, check for doneness 5 minutes before the baking time stated below. Center a rack in the oven and heat to 350º F. Butter and flour an 8 1/2-by-4 1/2-inch loaf pan. Place the pan on an insulated baking sheet or on two regular baking sheets stacked on top of the other. Whisk the flour, baking powder, salt, cinnamon, and cloves together, set aside. 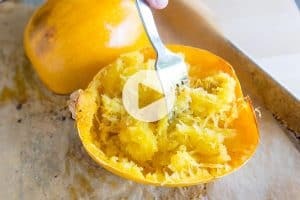 In a large bowl, rub the sugar and orange zest together until the sugar is moist and fragrant with the orange. Whisk in the eggs and vanilla until blended then whisk in the cream and rum. Switch to a large rubber spatula. Scrape the sides and bottom of the bowl then add the dry ingredients in 3 parts, stirring gently until they disappear and the batter is smooth. Fold in the melted butter in 2 parts. The batter should be smooth and thick. Pour batter into the pan and smooth the top. Bake 50 to 60 minutes, or until a knife inserted into the center of the cake comes out clean. Make the rum syrup as soon as the cake goes into the oven. After 30 minutes in the oven, check the cake for color. If it looks like it is browning too quickly, loosely cover with aluminum foil. 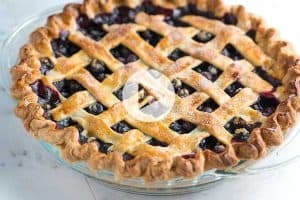 As soon as the cake goes into the oven, stir the water and sugar in a small saucepan over medium heat until the sugar melts, then bring to a boil. Remove the pan from the heat and stir in the rum. Transfer syrup to a heatproof bowl or cup and let cool. When the cake is done, transfer it, in the pan, to a wire rack to cool for 5 minutes. Unmold the cake and place right side up on the rack. Position the rack over a baking sheet lined with parchment paper or foil. Using a toothpick or thin skewer, poke holes all over the cake. Brush the cake with the syrup. Do this slowly so the cake has a chance to absorb the syrup. Cool the cake to room temperature, slice and serve. (We love adding a dollop of whipped cream. Fresh fruit is also nice). 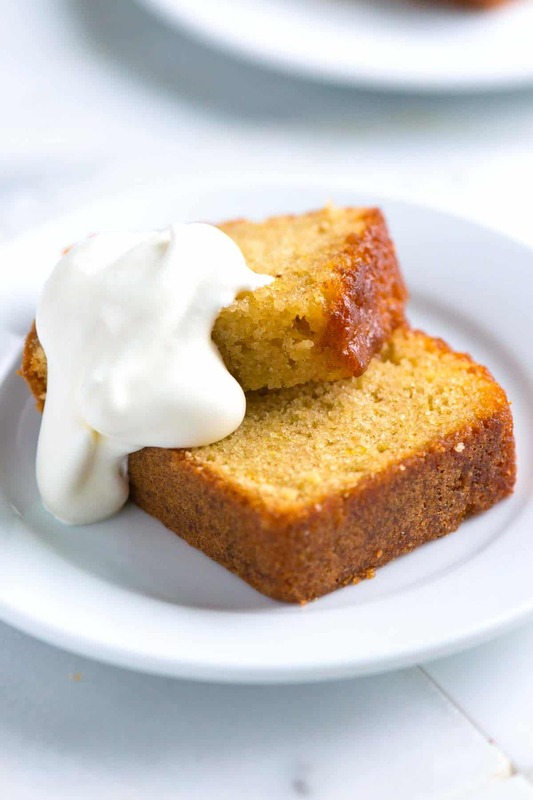 Recipe inspired and tweaked from Dorie Greenspan’s Rum-Drenched Vanilla Cakes. The recipe can be found in her incredible book: “Baking: From My Home to Yours” – we highly recommend it. This cake looks fabulous, I love the Rum Syrup. Hi, do you think I can bake this in mini loaf pans like a 5×3 loaf pan? So I can make them as giveaways for the holidays. Thanks! You should be able to. The bake time will be a little less, though. How long would you recommend the cake will last after baking it? Once cooled and wrapped, the pound cake should last a few days at room temperature and a little longer in the refrigerator. (We like keeping it chilled in the refrigerator). 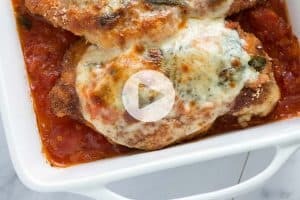 I want to make this but in mini loaf pans how would I adjust the cooking time???? HI Julie, We have not tried adapting this recipe to smaller pans, but mini-loaves tend to bake for about 30 minutes. (Depending on how “mini” your pans are, of course). Here’s what we suggest: Reduce the temperature by 25 degrees or so then bake a test loaf. Check for doneness around 20 minutes and go from there, checking with a toothpick every few minutes. Hope that helps! This looks so delicious. Cloves and oranges were made for pound cake!